Website devoted to Heider tractors run by John C Heider. Below are a few links that may prove useful and contain more information on various subjects related to the Rock Island Plow Company and Heider. A nice link to letters and Rock Island advertisements between B.D. Buford and cousin Simeon R Buford. One of the largest antique tractor forums and a good source of information. 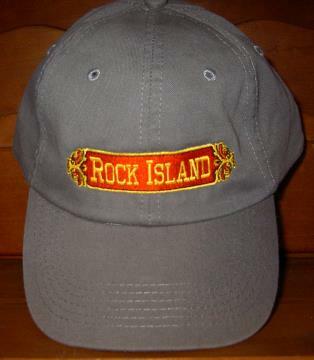 A page devoted to the Rock Island G2 including a registry and photo archive. Very informative website on all things Alamo Engine including serial numbers. Dad and I are relative newcomers to officially collecting antique tractors, although not to farming with “vintage” farm equipment in Northern Rock Island County, Illinois. The family’s first tractor in the 1920’s was a locally built Heider C that was sadly, long ago scrapped (story’s are told of great grandpa going down to Rock Island on weekends and a friend letting him into the factory to pick up parts). The tractor that followed was a Rock Island G2 which left the family farm sometime in the 70’s to a collector in the lower portion of the county (we would like it back). Growing up I heard dad frequently wish we still had those tractors. Grandpa, I think, was less enthused. The day after dad’s retirement sale from farming we went to a small auction near Rock Island and purchased the first Rock Island the family has owned since the G2; In this case an H5. A lucky break on a Heider C soon followed and just like that we were in business. Sad to say, but we soon found information on the Rock Island Plow Company and Heider to be somewhat sparse. I soon started digging deeper into company history and before long the suggestion of compiling my findings into a website was made. Now, here we are. Our tractor collection includes a 1917 Heider C 12-20, a pair of Heider motor cultivators (M1 & M2), a Rock Island early model ’27 F short fender, ‘28 G, early ‘29 G2 gas only w/pto, a later model G2, an FA, H3, H4, H5 and an H22. We are actively hunting for tractors to round out the collection and parts tractors. We also collect implements and have a diverse collection of Rock Island gas engines including very rare Haish built 4 and 6 hp’s, as well as a Great Western. 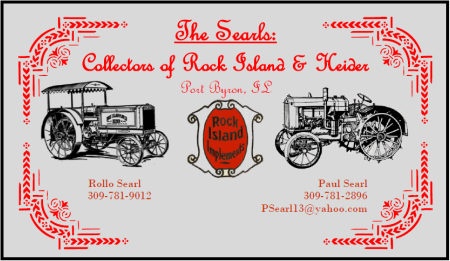 Our home show where we hope to be displaying our pieces of local history is the Geneseo, IL Antique Engine & Tractor Association which now takes place in Joslin, a mere few miles from Rock Island (just up I-88). We usually have a major portion of our collection at the show. Below is our card (for anti spam purposes an image). I wish to thank everyone who helped contribute to this site and those that may no longer be with us but helped save so much of our history, without whom this site would not be possible. I hope you found this site useful, and if you have information, stories, photos, ads, a correction to this site or even are parting with a tractor; please, contact us. I am also on Smokstak under this name. If you see this hat, chances are its Dad or I at a show. David Parfitt’s webpage containing photo’s, collections and a world wide vintage tractor registration including Rock Island and Heider. Steve Barr’s auction and show photo archive from around the Midwest. A nice little forum centered around antique tractors and history in Canada.